Kevin has been training at Chicago S&C for over a year and wasted no time signing up for his first competition. Kevin rocked the Chicago Strengthlifting Challenge at the end of April, PRing his squat, and impressing the world with his neon socks. Kevin brings humor, a passion for guns, and an infectious positivity to the gym that makes everyone excited to train when they see him. Kevin has tenaciously worked through some injuries and refused to miss his training, even when he is having a bad day. Kevin lives near the gym and loves to sing the strength training gospel to anyone who will listen. I’m 48 years old and have been working for Microsoft in the consulting, developer, and sales divisions for the past 20 years. I’ve been married to my wife, Angelique, for the past 25 years and we have two daughters, Chloe (17) and Abigail (15). What was your exercise history before Chicago S&C? Over the years, I had done a combination of Beach Body programs, including P90X, T-25, and most recently, 21 Day Fix. Leading up to my joining Chicago S&C, I was working out 3 days a week using my Bowflex, running on my treadmill, and constantly striving to weigh less than 165 pounds. In my resistance program, I was increasing the weight somewhat from workout session to workout session although by no means was I doing any version of the novice linear progression. And I like to eat. A lot – and none of it consists of vegetables, so it was always a struggle. How did you find out about Chicago S&C and what was the catalyst to get you to contact us and come in your first day? He took the time to explain how the low bar squat worked, how it wouldn’t be an issue for Angelique, and that she should seek out a coach rather than start online. He pointed out that Karl Schudt coached in the Chicago area and as we talked, we looked up Karl and found that he was in Tinley Park. Considering that we live at Devon & Milwaukee in Chicago, Tinley Park was out of the question. Matt went on to say there’s another awesome guy in Chicago, David Abdemoulaie. Lo and behold, we find that David and his gym are less than 2 miles from our house! The crazy thing is that we’ve been past the gym hundreds of time, eaten two doors down at the Elephant, our favorite Thai place, multiple times per week – and never knew the gym was there. 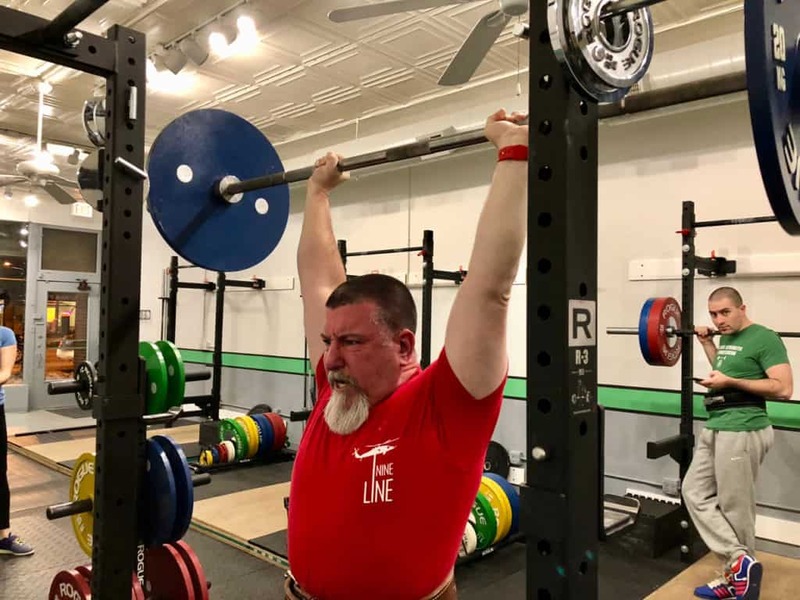 I reached out to David, scheduled an introduction for him and Angelique to talk, and David recommended we come in for the intro to barbell course led by … Karl Schudt! This is an example of what a small world it is and we saw it as clearly a sign that something was headed in the right direction. We took the intro course and signed up for a 6-month membership, came to an end in March. Then, we signed up to continue our membership because we’re addicted to strength training! So, I joined specifically to help be an advocate for my wife and to support her. I’ve ended up staying not only because of her but because of the great gym community and my own personal progress. What are your current personal bests for all the lifts? (Squat, bench press, deadlift, press) and what were your personal bests before you started at Chicago S&C? I never had any frame of reference prior to starting at Chicago S&C, so it’s all new progress to me! Tough question. I really enjoy squatting for no other reason that it is such a seemingly simple movement, yet it is intrinsically complex for me for some stupid reason. I also enjoy that it gets every part of my body involved in the movement – there’s no “leg day, arm day, whatever day” – it’s always squat day. That said, I thought for certain my press would be forever stuck at 50kg earlier on in my progression – there was no way that bar was going up with my aging shoulder injury – but some coaching and education on the importance of bar path fundamentally changed that (and is changing my bench as well). I think I press well now, which makes it one of my favorite lifts and I still have the, “there’s no way it’s going up again,” mentality and yet it does. How long after starting at Chicago S&C before you noticed a difference and how has barbell training made a difference in your life? The first two days I started strength training, I was sore, and after that just tired – but the recovery comes quickly and surprisingly, I’m never sore anymore like I was when doing all of the Beach Body programs. This is now more than 6 months later and it’s encouraging that every trip to the gym is a challenge, every trip I’m going to do something that I’ve never done before, and I can be proud that I’m always making progress. Even when my recurring low back injury flared up and David reset my squat and deadlift, we switched to Romanian deadlifts and I watched my grip strength improve. Fewer and more intense sessions for sure. It’s also nice working out with a community of people rather than working out by myself. Previously, working out 5-7 days a week with a program like 21 Day Fix gets old and lonely. Contrast that with 3 days / week and the rest between sets makes for a much more enjoyable time. Furthermore, seeing constant progress is a big thing – before, progress was measured by my weight on a scale, with an ever increasing drive to lower that weight. Now, I’m working to increase weight – both on the barbell and in body weight, but doing so in a much smarter way than before. I’ve since invested in a Rogue squat stand, two barbells, and bumper change plates so that my daughters can start doing the Starting Strength program at home, as well as setting ourselves up for those times when we can’t get to the gym for some odd reason and need to knock out training at home. I’m happy to say that my youngest daughter has started and is enjoying it as well. The older daughter, however, is still playing too much XBOX. What would you say to someone who is unsure about starting a barbell strength training program? How would you convince a friend to get started training? Strong people are harder to kill. Think about the aged grandmother who falls, breaks her hip, and is never able to recover. Think about being in a position to better protect and care for those you love and who are close to you. Think about how good it would feel accomplishing something 2-3 times a week that you’ve never done before. Think about getting the maximum effect of the time you spend “exercising” and channel that into “training” for a better life now and a better life later. This is what comes from a barbell strength training program. As for convincing a friend to get started training? I would mention all of the above benefits combined with the incredible community at Chicago S&C. The level of respect everyone shows when someone is doing something hard continues to impress me. From the strongest lifter to the novice lifter, everyone stops to cheer on someone’s personal best. It’s celebrated. It’s rewarding and it’s welcoming. You have nothing to fear. Come get stronger.